One of the true advantages of being a thermometer manufacturer is that we know how our products work and how to repair them. ETI is committed to supporting our customers, no matter which instrument they have chosen. The service department team is equipped with the best resources, all repairs are undertaken in-house to give an unrivalled after-sales-service. For an example of our product's build quality click here to see the ETI thermometer that refused to die! 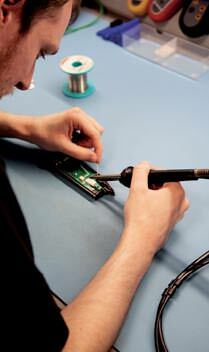 The vast majority of instruments that are damaged through use in busy commercial environments can be repaired. Naturally, there is a charge but we wish to encourage you, the customer, that it can be cost effective to repair an instrument rather than throw it away and buy a new one. Whilst an annual calibration check is all you need for continued confidence in your instrument, there are times when you may wish the added assurance of a full service, with the benefit of a further years guarantee. Instruments for repair should be sent to your local distributor, or direct to ETI, carriage paid. Please include: Sender's name, company name (if applicable), address, telephone number and a brief description of the problem to assist in rapid diagnosis. Failure to do this will lead to a delay in the servicing of your instrument. Download form here. Alternatively click here and fill in our online quotation request form. Contact the service department for advice on any non-ETI units you wish to return for repair or calibration.